The new head of the Environmental Protection Agency says an announcement on fuel efficiency standards will be released "very soon" as the agency works to "reduce regulatory uncertainty." 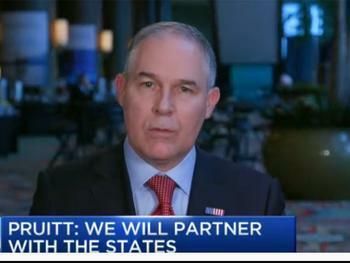 Scott Pruitt also told CNBC that he thinks Congress should decide whether carbon dioxide is a harmful pollutant. The Supreme Court ruled in 2007 that greenhouse gases are an air pollutant that can be regulated under the Clean Air Act, but Pruitt said Congress has never signed off on the decision. "Nowhere in the continuum, nowhere in the equation, has Congress spoken. The legislative branch has not addressed this issue at all," he told CNBC, although the Clean Air Act was passed by Congress in 1963 and amended by Congress in 1970, 1977, and 1990. It is widely expected that Pruitt will scrap tough fuel efficiency standards enacted during the Obama Administration, a decision consumer groups say would be a mistake. The Consumer Federation of America issued a statement today warning that American auto manufacturers would be at risk of losing market share to imports if the fuel economy standards were weakened. Carmakers, like other industries, have been pushing hard for loosened regulations. Their argument may be buttressed by a new report that finds that U.S. cars and light trucks from the 2016 model year will be the first to fall short of fuel economy targets in more than a decade. The National Highway Traffic Safety Administration is forecasting that 2016 models will average 32.1 miles per gallon, below the target of 32.8, according to an Automotive News report. The agency forecasts another shortfall in model year 2017 of 31.8 miles per gallon compared to a projected target of 33. If the projections hold, it will be the first time since 2004 that the fuel economy targets haven't been met. Automakers were quick to say the shortfall proves the targets are too stringent. Pruitt, former attorney general of Oklahoma, is a self-described "leading advocate against the EPA's activist agenda" and sued the EPA more than a dozen times during his tenure as attorney general.